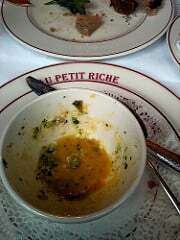 Always on the lookout for classic French bistros, a friend and I recently stopped at Au Petit Riche. I’d eaten there before and found the food decent, but I remember the company a little better than the food. I was dazzled by the stunning interior and the conversation, which should have been a tip off since I rarely forget anything I eat that’s good. Many Americans have become more astute about dining and want to know where the ingredients are from, how they are handled, what part of the animal they’re getting. 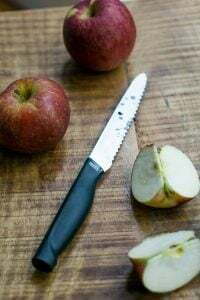 It’s part of the farmer’s market movement, as well as a number of folks striving to eat locally or at least show some concern for where and how their foodstuffs are raised. 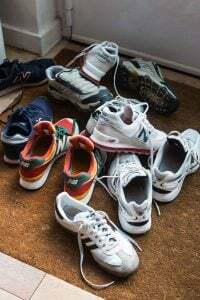 And there’s also the do-it-yourself movement, where everything from upstart ice cream shops are opening, and of course the bean-to-bar movement, where every step of the process is carefully tended to. In general, the French don’t ask those questions because France has always been a deeply agricultural country, with close ties to their terroir. When dining with friends from the states in Paris, I know they’d be disappointed to find frozen green beans with their steak, or boiled white rice heaped on a salade Niçoise. So I am always careful to steer them away from some of the classic bistros on their lists, ones they may have eaten at a decade ago, or that a friend recommended. People, invariably the ones who don’t live here, laugh when you mention bad restaurant service, and say, “Oh, that’s just so French!” But it isn’t. Real French restaurant service is professional. Even in a humble café that serves croque monsieur, where one waiter covers the whole dining room, there’s a difference between rude and harried. I don’t expect, nor want, the waiter to come racing over the refill my water glass—if I want something, I’m capable of asking, and don’t need them “checking in to see how I’m doing with that” with me between each and every mouthful. I love the interior of Au Petit Riche, which is slavishly classical down to the metal bar you step up to when you enter and the generous dusting of baguette crumbs which cover the waiter’s station. When we sat down for lunch, the waitress handed us the menus and the wine list, and immediately asked us what we wanted to order. My backside had barely landed in the seat, literally, and faced with a three-page menu, I said that we’d like a few minutes to peruse it. After she took our order, she then asked, “And what would you like to drink?” As my lips just began to move to form the words with our wine selection, she turned and walked away before I could respond. At that point, I should have thanked her for her time and left. (Like other customers did when I was eating at Le Repaire de Cartouche.) But having eaten at Au Petit Riche once before, and being familiar with the quirks of French service—and how you sometimes need to wait it out win them over, we stayed. Our first courses were really good; my friend ordered the foie gras, which was generous and the two slabs were served with nice, warm toast. The shriveled up poire tapée alongside was a poached fig, or so insisted my friend, since it was somewhat unrecognizable. My Œufs cocotte was served with a bright-green emulsion of fresh herbs and tiny points of asparagus which was so good, I scraped the warm little bowl of dreamy poached eggs clean. Anticipating our main courses, when they brought them over, it was as if the first kitchen crew had taken a break and another one stepped in to send out the main courses. My companion’s filet of bar (bass) was fine, but the étuveé of fennel, piled up next to it, was a drab gray-green mound of vegetation that was so uninviting that she ate one tiny piece, made a face, and pushed the rest away. With fresh fennel abundant and in season at every market in Paris, why not serve a simple tangle of it quickly tossed with a bit of olive oil and lemon juice, and perhaps some chopped anchovy? Any competent restaurant cook could put that together in less than thirty seconds. I find the lack of concern and care disrespectful to French cuisine. My Suprême de poulet farci aux trompettes was a rolled up chicken breast that was pitch white and without flavor; perhaps it had been previously frozen. * The trompettes flecked in the stuffing were black trumpet mushrooms, which I was convinced were there for appearance and they had even less flavor than the chicken. A handful of herbs, or something else with flavor, would’ve been preferable for a kitchen on a budget. The chicken was served cut on the bias and upended, the sauce underneath was simply unseasoned liquid tomato sauce; a pre-prepared puddle slathered onto the plate. One of the great things about Paris are the gorgeous old bistros and brasseries that serve hearty traditional French fare. Places like Chartier, Chez Dumonet, and A la Petite Chaise manage to serve respectable French fare and do it well, each at various price points. People say that French food is dying, or is already dead, and point to Spain and Italy as beacons of inventiveness and freshness. With McDonald’s and Subway taking over France (folks often blame American imperialism for the spread of these places, and it’s easy to implicate the companies for planting their feet in France, but they wouldn’t be as wildly successful as they are if there weren’t lines of locals streaming out the door), I sadly wonder how if any real, honest bistros will be left in Paris in the next few years. For the best French fare, I hit the wine bars, preferring to enjoy the wonderful charcuterie and cheeses of France, still made with care by the various producers in France whose depth of flavor make it clear and obvious that they’re proud of what they do. 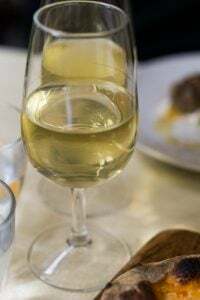 And it’s interesting sipping glasses of natural wines, which are exciting not always because of their flavor, but because they’re examples of the younger French generation attempting to use less processed foods and experiment with various other ways making wine. True, some of them aren’t great, but they’re honest and each glass I try is a little bit of a challenge to what I think wine should be like. Le Verre Volé, Le Baron Rouge, La Garde Robe, and Tombe de Ciel are some that I frequent often. 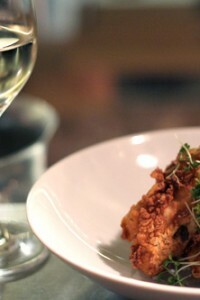 The service is always friendly, the food is simple, and wine orders are always taken, happily. *In Italy, when restaurants serve frozen foods, they note which ones at the bottom of the menus. Several readers noted that that is the law in Italy, and although I have anything against certain frozen foods, whenever I saw that, I though it was nice of them to notify guests so they could decide for themselves before ordering. 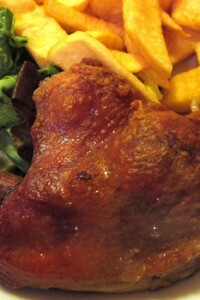 Oh wow, I am sad to hear it – on a positive note, every bistro and café that I ate at last weekend in Paris was superb. So maybe the better ones will survive? Dave……This is all very depressing !!! Vouchsafe the wine bars so I guess there is light at the end…. I think I’m going to be bummed out all day..
Sam: It was just startling the difference between the first courses and the mains. But having worked in restaurant for 35 years, both in the kitchen and the dining room, I can forgive a lot of things (because I know it’s a very hard job), but I can’t fathom when people treat customers poorly without provocation. And I know not everyone has a good day, but there were only four tables occupied in the restaurant that day for lunch. Jenn: Yes, there are lots of good restaurants here, but like anywhere, you have to know where to go. And it seems classic bistros aren’t faring all that well, which I wish wasn’t happening. Please feel free to share any good addresses; we’re all always on the lookout for good places to eat and it’s nice to support them so they continue to survive and thrive. Sorry for the disappointing experience, but thanks for the tips. I’ll be in Paris briefly in January and would hate to waste one of my few meals there on bland chicken and watery tomato sauce. I worry that as all Europe becomes standardised and globally we see the Codex Alimentarius implemented that the systemising of of dining in larger cities is not completely inevitable. Who can afford the rent, the staff wages, the taxes? To achieve what so many small Bistro’s have done for years previously may take a serious reappraisal of the economic climate in which the operate. Justin: That’s all certainly true, with the EU hygiene and other rules. And it’s hard to run a restaurant in an expensive city. However places like the wine bars mentioned, and restaurants like Les Papilles, Bistro Paul Bert, and A la Biche au Bois turn out excellent food at very reasonable prices (approx €30 for a multi-course meal). Our lunch, without dessert & a carafe of house wine, cost €80 and we skipped dessert. Generally speaking, a formula for success in the restaurant business is to serve good food at prices that customer think is fair, so they keep coming back. And to treat them nicely, without being patronizing, to make the experience enjoyable. Guess I’ll got have a Papaya dog……maybe 2..
Wow, looks like the Entree verses the main = night vs day. I find it funny that the server was so rude, when the French lay the claim that to be a server is a career, not just a Job like it is here in North America. Perhaps she thought you were another tourist? The chicken dish sounds so unappetizing. I would expect that if the breast was stuffed with Trumpet mushrooms that there would be a blast of flavor there. I am wondering why the sauce would be a tomato sauce on the bottom, be it seasoned or not? Why would someone mar the delicate flavor of the mushrooms that way? Last November, my boyfriend and I visited Paris for two weeks and someone suggested your website as a great place to get restaurant recommendations … I think approximately 88% of the places we visited were learned from your website and I catch myself dreaming of the things we ate 8 months after the fact even in the food mecca that is our home, New York. So thank you! That being said, I can’t remember if we learned of this restaurant via you, but have you been to Casa Olympe on Rue Saint-Georges in the 9th arrondissement? I would like to try making your quark cheesecake (https://www.davidlebovitz.com/recipes/sc_cheesecake.html)–with quark, not sour cream. If I use quark, should I replace both the cream cheese and sour cream with it, or just one? And how much quark should I use? As for French service vs American service: I much prefer the French. They give you your food and drink and leave you alone. the table is yours as long as you want it, and if you need something (including l’addition), you simply say S’il vous plait and ask for it. To me it is much more professional than having someone hover over you while you’re trying to enjoy a meal and the company of others. We came to really appreciate this during our half year in Paris. Now we’re back home, to staff rushing us through our meal and out the door. They must turn the tables over in order to make more tips. I think, too, they are pressured by management to turn the tables over two or three times per evening. In order to avoid this kind of service, one must go to a quite pricey restaurant. Oh, and it is my understanding that noting frozen food on menus in Italy is now mandatory. We noticed it this summer, but not in 2007. I think I would prefer the French way of dining, because here in the States I hate being asked every 5 seconds if I need anything. On the other hand, I do hate the feeling of being forgotten. A nice happy medium would be fine. Often times I’d like to linger much longer than I can guess restaurants here are comfortable with. Your post is very interesting as usual. I visit France every so and so and I have sadly noticed that brasserie food has gone done over the years. Nevertheless I also have had unexpected and pleasant experiences, especially off the beaten track. About frozen food, Italian restaurants are required by law to state if ingredients are frozen. An interesting and educational post, and entertaining as always. Thanks David for this wonderful article….and you are totally right with the wine bars. Never had bad service at one yet and the proprietors are always curious about the Anglo-looking, living in Paris, who frequent their wine bars and inevitably strike up conversation. Always a pleasure to visit these small gems in the city. David: that was the saddest thing I have read in a long while. I guess if you want good French food, you are going to have to move back to the states? I was making your mojito granita yesterday (delicious, by the way) and wondered why you picked Paris over say Rome when you love ice cream so much. American waiters who constantly top-off 1/2 or 3/4 full water glasses, even when it is clear we are winding up our evening, simply drive me nuts. Unfortunately, keeping water glasses full is a standard practice and expected at most establishments in the US, and even requests to not do it usually are forgotten because the habit is so engrained. I’ve taken to placing something like a coaster, napkin, etc., over my glass to avert the over-watering syndrome. Excellent advice about the Wine Bar instead of the Bistrot. Still what’s one to do when you’re craving a croque madame and don’t know the first thing about making one (other than buying an egg)? The links were (almost!) as informative as you article. Thanks for including them! … Except to recommend, in Paris, le Dirigeable (37 rue d’Alleray, 15e) and its Annexe du Dirigeable (4, rue de Dantzig 15e). Last time I was there I was served a delicious helping of Burrata which was quite simply a melting piece of heaven. Everything is fresh and they always have some quirky interesting wines in their selection. I love your Bistro review and thoughts! I wonder if food “movements” wax and wane and French Bistros are just sitting at a low point for now? When something becomes subpar a reaction seems to happen after time to adjust the problem. Improve or die. Here our food movement has come on so strong I feel we must be reacting to all the garbage forced on us for the past 40 years. James Beard would be proud if he were still alive. Or at least he could finally get a chicken worth eating! I just spent 10 days in Paris with a passel of family – 9 in tow (11 including my husband and me). We had a couple of not wonderful experiences, but I was amazed that when we landed – more than once – at a place that looked seedy, that had menus with pictures (!! HORROR), that the food was still good, and good enough that a few in our party, not unaccustomed to gourmet food, just loved it. Of course weather and outdoors and Paris might have helped the taste a bit. It was all fresh, freshly prepared and tasty. Service was generally very generous – they tried heartily to accommodate our big group. I love Paris anyway and will go again and again, but if you’re visiting Paris and not going there just to eat food, there is an abundance of lovely places a bit off the tourist path where you can get very good food. BUT the next time I am there just with my hubby, I’ll try some of the places you’ve recommended!!! How very sad that one of the things that always made France special is dying. Perhaps there will be a revival. I can hope! p.s. – the chocolate cake is SO good and we’re having tomato tart for dinner. Thanks again for all of the good ideas and recipes. David: Great (but a little sad) post as always. The nicest lunch I had in Paris last visit was not at a bistro but at a CHAIN restaurant – gasp – from Belgium that is nicely placed near the Hotel De Ville called La Pain Quotidien. 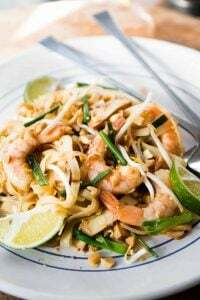 It seemed in keeping with what I look for in a good place to eat – thoughtfully prepared ingredients simply prepared to take advantage of their best characteristics. (I think that they also have one in NY, NY and other European locations.) It’s too bad that the pride that is taken in French baking and pastry isn’t reviving some of the classic bistro fare as well. Maybe you need to open a bistro! I have been in Paris for a month now and have been very fortunate on this trip to have had some outstanding meals. I loved my meals at Les Papilles; Robert et Louise in the Marais was wonderful too – get the escargot as an appetizer! The charcuterie and cheese boards as well as the wine at Le Garde Robe were great—I’ve been three times. My lunch (formule – entree, plats, and dessert) for 20 euros at Glou was delicious and a great deal too. We tried to grab a table at Le Verre Vole but did not have reservations. So we ended up at Le Poisson Rouge just down the road a bit and had a wonderful meal that was matched by the service. La Ferrandaise in Saint-Germain des Pres, while not the least expensive, was scrumptious and the desserts were all heavenly. As for service, I much prefer the service here than back home in the US. What a delight to take 2 or 3 hours to enjoy a dinner and not feel hurried and rushed. Reading this, i feel extremely lucky having had the opportunity of having had dinner at Brasserie Georges in Lyon, this past March, on my very first foray into France. The food was exquisite (I am still dreaming of that Dôme Croustillant au Caramel et Beurre Salé), the service superb, really good value all together. I ate there a few months ago and was seriously underwhelmed! Although the service was quite good I found the menu very resticted – I ate what was basically beef stew and whilst it was OK it wasn’t stunning. However the wine list was another matter! I adore Chinon and they seemed to have nearly a page of it – and in half bottles as well as full ones. The cheese board was exceptional. I did notice that virtually every other table was filled with Japanese tourists who appeared to be on some sort of fixed menu. Overall I should have gone with my gut feeling and eaten at a little cafe on Faubourg Montmartre where the peppered steak is less than €11 and they cook it saignent as requested (a problem I have in Paris – she’s English so incinerate the steak! ),and the main and cheese with a demi of wine (palatable if not exceptional) is usually less than €30 rather than the nearly €80 for the meal at Au Petit Riche. I too adore Chartiers – more for the experience than the food! My French friend always has confit as it is so reasonable compared to other places, the portions are small enough for me to eat a main, cheese and desert and the Buzet wine is acceptable in all its forms. And the waiters are a show in themselves! Have you tried Les Pipos in Rue de l’École Polytechnique? This was one of my favourite small and affordable bistros while I was living in Paris. It’s simple food, prepared well. It’s particularly charming in early spring, sitting outside near the blossoming trees. I feel that no matter what, there will always be a handful of French bistros and brasseries that are great. The thought of such places becoming obsolete just doesn’t seem reasonable because being the only thing of a certain category will generate lots of business, simple supply and demand theory. I appreciate your explanation of service in France. It helps me to understand that cultural differences are just that — differences, not necessarily rudeness. Stories like this make me wonder if I’m not just as well off, 9 times out of 10, eating in San Francisco or LA instead of making a trip across the pond – but I’m sure that won’t stop me when the time comes! Charissa: I like that place, too although last time we went, they ran out of wine (yes, you read that right) and we saw mice running around at the location in the Marché St Honoré. Still, the food is fresh and good. Earl Lee: I like to think that, too. And hope that the traditional French bistro is not truly a dying breed. It was certainly be sad. Julia: I haven’t, but thanks for the tip! Eli: Yes, the wine list is great. 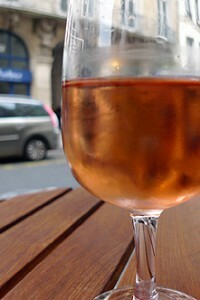 I like wines from the Loire and Chinon, and Vouvray, and that was something that impressed me about the restaurant. Unfortunately the food and the waitress didn’t match up to the excellent wine service. And in spite of it’s flaws, and not having terrific food, at Chartier, you get what you pay for. The waiters may be gruff (and extremely busy), but they’re certainly not rude. In fact, they’re quite professional. Still, it’s best not to order anything too ambitious and just stick with the classics. Laura: I think sometimes things (like cuisine) may need to hit rock-bottom before they change. Twenty years ago, I never would have imagined in the states a chain of upscale coffee shops, organic supermarkets with aisles of food, and places like McDonald’s and United Airlines serving mixed baby greens. So perhaps they’re going through a transition and this is temporary. I hope so. Your bistro experience makes me think of the “charming” corner French bistro that opened a couple of years ago in our San Francisco neighborhood. I am convinced that they are microwaving frozen prepared meals since I’ve looked into their kitchen from the street and have never seen anything that looks like real cooking going on in there. The two times we tried the place the food was awful: dried out rabbit with a tasteless brown sauce, beet raviolis that had an unpleasant musty taste, etc. And the one time we went in to have a drink at the bar, they served the cheapest Armagnac for a very steep price. We call the place our neighborhood fake French restaurant but, guess what: it’s packed every night with people dutifully eating their dinner. My best friend and I spent a week in Paris in November and we used your blog (and books) to guide us through the week…as a matter of fact she just gave me your new desset book. You are our French hero! We’ve taken cooking classes and her favorite city in the world is Paris even her 50th birthday party on Saturday has a Paris theme! It would be a “kick in the pants” if you would wish her a happy 50th…really what a gift to hear from the great DL! If you are feeling spunky email her a birthday wish at eringranberry@comcast.com she would freak out! These Mississippi girls would love a shout out! Don’t change a thing you are the bomb! 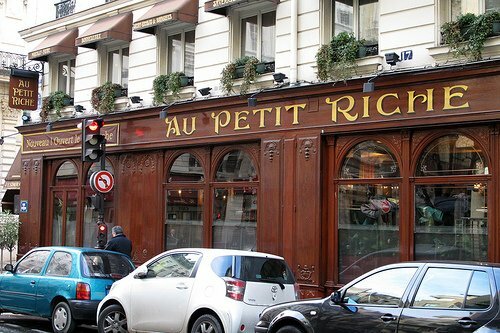 Au Petit Riche, on my one occasion dining there, seemed to go out of their way to ruin my friend’s birthday. It was after a ballet performance at the Palais Garnier on the 27th of December. The service was so ridiculously terrible that we ended up laughing at it. The lentil salad was very good, everything else was completely forgettable. We had to ask 3 times to get our wine to the table. The birthday friend went to the bar where the manager or supervisor on duty was hovering to complain and — for his trouble — was cruised by said manager and had to field some not-so-subtle inquiries. Never again. Please don’t remember I said that. I don’t know about French food being dead!? The only time I have been to Paris, every meal we had was somewhere on a sliding scale from “very good” to “brilliant”! I can’t stand waiters who keep coming back to see how I am coping with feeding myself – I just want them to go away! I really don’t see french cuisine dying away anytime soon. I do, however, agree that many establishments need to get up off their laurels and rise to the occasion before they go under, because people will avoid places that deliver subpar experiences. I love the look of the classic brasseries with their zinc bars, and belle epoque detail too, and there are still some decent brasseries and bistros in Paris with wonderful food that are absolutely worth vising, as you have noted. Also, have you tried Brasserie Balzar in the Quartier Latin, near Sorbonne? They do a truly wonderful chicken and frites, and a very fine classic onion soup. The waiters there are pushy bullies, but it’s fabulously entertaining. La Fontaine de Mars is another great one, near Tour Eiffel in the 7th, with its adorable red and white checkered tablecloths, and brass and wood details. I absolutely love their wine poached eggs, ile flottant, and artichoke chevre salad (I even tried to duplicate it on my blog). Charming and personable wait staff, too. I haven’t tried Chartier, though I deeply enjoyed your post on it. In addition, think the gorgeous old Belle Epoque cafes like Le Coupole that prepare standard classics correctly, and do beautiful seafood, still offer special experiences to be enjoyed while in Paris. I hope all of those subpar brasserie and bistro managers read your blog and get a clue. (Canned peaches??? Shameful.) I would hate to see any of those vintage beauties turned into Starbucks. I think Americans – and I’m Australian, so I don’t mean to generalise badly, but this is just judging from my experiences visiting the States :) – sometimes forget that the waiting “norms” in the US are vastly different from other countries because other countries tend not to have the same tipping culture that has engendered the kind of “hovering, uber-friendly” atmosphere that marks US restaurants. I far prefer being left alone with my meal, so I found American restaurants a bit confronting, not French ones! paradise and utterly indifferent to making itself known to the outside world. I know of a no more genuine absolutely uncorrupted part of Paris. La Pelouse with serving you from many tables outside. There is a Paris you did not think existed any more. Let alone a few blocks away that legendary patisserie L´Eglise (by the church on place Jourdain) famous all over Paris for its millefeuille and homemade icecream and sorbets. suedoise: I like that area as well, including the market, and profiled Boulangerie 140 (the bread-making part of Pâtisserie l’Eglise), a while back, which is pretty terrific. Hannah: I agree, but perhaps because I am now used to the other style of service where everyone is not racing to wait on you. I remember the times I’ve gone to Mexico; it always took me a few days just to relax and get use to the fact that if I was eating or drinking somewhere, the wait for anything would be much longer than in the state. The tipping culture in the states is something that is constantly being reviewed and when I worked at Chez Panisse, over a decade ago we switched to ‘service compris’, as they do in most other countries. People say that tipping encourages good service, but I’ve had good and bad service in restaurants where you tip (and in taxis, etc..). Martin: It was funny because I went to a favorite restaurant the other night and I had to ask the waitress at least 5 times for the carafe of water I ordered at the beginning. She kept forgetting it and instead of it being an irritant, I started making it a joke between us because she really did keep forgetting it (and apologizing) and it became a running theme. On French television some time ago there was a report on Parisian restaurants and how a large number of them serve mass-prepared and frozen foods. I don’t recall the exact percentage but it was shockingly high. Keep sharing the good (and bad) addresses… if I go out to a restaurant, it’s precisely because I’d like someone to cook for me, not serve me something I could have bought at the supermarket. Some of the worst service and MEALS I’ve ever eaten have been in France. This is country that I LOVE with an indisputable cuisine. I have never understood why people in the service industry are so cranky. It is so important to know where to go and what has changed. Thanks for your article today. Where you will always find SUPERB service in restaurants, be it small or Grande, the food may vary, but you will never be angry is ARGENTINA. Those (mostly) gentleman working the front of the house are fantastic. If you are a table of two or twenty, no order is ever written down or confused! Wish they could get the rest of the situation sorted out. great to get such a trustworthy lowdown. From suedoise: “I live by the Buttes Chaumont park in the 19th arrondissement, a true paradise and utterly indifferent to making itself known to the outside world. I’m in the same location, on the downhill side of the park, and I have to agree — it’s a kind of paradise here. I love it. While I am content with this area not being totally run over by thousands of tourists, I think it would be smart of people to check this arrondissement out before making judgements about Paris as a whole when it comes to restaurants and their decline. There is an authenticity in this part of Paris that I feel is lacking when I go to other parts of the city, and it’s possible that the things people used to appreciate about Paris are still present here, like suedoise writes, too. I don’t eat out much, or really at all — food intolerance issues and lack of funds are the biggest reasons. But I know I was very content with the food and service at La Kaskad’ Café on rue Manin next to the Mairie XIXeme the one time I went there. I’m not sure if it qualifies as a “bistro” or just a regular restaurant — I am not too sure of what makes up the difference between the two. Is it the kinds of food that is served? It is whether there is a zinc bar present or not? A terrasse? Is it just the look and feel of the place? I’m really uncertain about what makes up a “classic French bistro” as opposed to just a café or restaurant. I really hope that you are right about this part, David: “Twenty years ago, I never would have imagined in the states a chain of upscale coffee shops, organic supermarkets with aisles of food, and places like McDonald’s and United Airlines serving mixed baby greens. Last Saturday we were sitting in a chain restaurant. The waitress had informed us that her name was something and her “team-mate” was so and so at a table near ours. The two asked how everything was a total of three times before the wine had arrived at the table. After the third pass-by inquiry if we needed anything, I mumbled to my wife, “Yes, a French waiter”. Service is an art. So many are painting by the numbers in US restaurants. They do not assess the status of the table and whether the food just delivered has been tasted before asking about its quality. I do prefer the French model of being available, but not intrusive. My overall memory of Casa Olympe is that it was pleasant, but then again, I was in a euphoric state for most of my time in Paris. I have a hard time recalling specific bites at Casa Olympe, even though I know we ate a lot. I think I got a fish dish that was fine and my boyfriend got something that was also just fine… perhaps veal or sweetbreads. Visiting their website now, I see a blood sausage appetizer that I have a hard time believing we could have ignored yet I have no memory of it. I do remember, more vividly, a table to my left with an American male trying very hard to impress his beautiful French dinner date. Dinner and a show, eh? Long rambling aside (je m’excuse! ), have you been to Au Bon Saint Pourcain on Bis Rue Servandoni near St. Sulpice, 6e? A note I wrote about the place was: “Food is superb example of what Paris bistros used to serve in the days before homogenization.” Other notes on my notecard: “They bring you a glass of their house wine when you sit down” and “Nothing fancy, very small (~8 tables max), could be used as the set for a 1940s movie.” I have no idea how we did not make our way to this place, but I’d love to hear your thoughts on it if you have/do. David, have recently found your blog and it is wonderful! Thank you for so many great tips and info…will be in Paris Oct. 4 for the very first time, and am relying on so many of your blog posts to help us sort out the city :) As you know, it can be a bit overwhelming for a first timer! I am enjoying, no LOVING, The Sweet Life in Paris. You are spot on with so many things I’ve found to be true there. Even with the occasional rudeness, the French approach to service sounds miles better than the forward, ultra-casual, “I’m here to be your best friend for the evening, how does everything taste?” business we get in the US. Personally, I’d much rather be given my food and be left alone to eat it than have someone asking me if I need anything else every few minutes (and invariably when I’ve just taken a bite and have to mumble with my mouth full to answer). I was in Paris for a week last September and grew to enjoy the more relaxed attitude of waitstaff. I actually find the American waitstaff habit of popping by every 5 minutes to top off water glasses, see if I need anything, try to interest me in dessert to be rather annoying. The one thing that kind of hung me up in Paris was when/how to ask for the check. A few times it was brought to the table and a few times I had to flag down the waiter. What is the proper “Parisian” way to get this accomplished? Karen: It’s considered improper to give a customer a check without them asking for it in France (it’s like saying, “Get lost!”) So you can just ask for the check from a passing waiter, and if you’re French isn’t up to snuff the internationally recognized symbol of your hand scribbling on a piece of paper transmits the info nicely. In more casual establishments, like cafés and small restaurants, you can go up to the bar to pay as well. But only in places that are pretty informal, which includes just about any café. For once you’re all making me grateful I live in L.A., despite the whole celebrity-chef obsession that makes most restaurants totally unaffordable for anything but a special occasion. Some restaurants still know how to focus on local, fresh produce and keep their prices within reason. For Bastille Day we went to Saint Amour in Culver City, where unknown Bruno the chef makes his own charcuterie (best head cheese I’ve ever, EVER had), the bistro fare is standard but superb and you’re never rushed or pestered during your meal. Your post really makes me appreciate Bruno and his bistro that much more. I’m sorry to hear that Drabification is reaching France. The difference in service is the professionality of it. In Europe (not just France) waiter is a professional who trained and even went to school with the expectation that he will be doing that profession for the rest of his life. He is not jumping up with a false enthusiasm but he does his job well, day in and day out. Mostly. In US the job of serving the tables is for the most part a transitional position. Most servers are students (some very young) and/or people who do it while looking for a more rewarding job. They only do what they were told to do and that is very different depending on the establishment that hired them. Different level of service in Denny’s a yet different in upscale dining. All the annoying questions about “how is everything?” and “are you still working on that?” and refilling and diluting my perfectly fine cup of coffee before I had a chance to say no, thank you I don’t want a refill. As you like wine bars, may I suggest you “La Bourgogne”,at the end of the rue Mouffetard, 5th arrondissement (next to the St Medard Church). It’s a wine bar AND a bistro, that serves excellent traditional French food and good wines for a cheap price (about 20€ for a main course, dessert and a glass of wine). Their pommes de terre sautées are terrific! Benoit is also a great bistro – a little on the pricey side, but excellent. Long live French bistros! Let’s hope they don’t all become a corporate entity. To Hannah – Au Bon Saint Pourcain at St. Sulpice in the 6th has long been a favourite of ours. My husband and I discovered this tiny local gem 10 years ago and we call it “Behind the Curtain” as when you enter, you come through a velvet curtain into the dining room. In cold weather, it serves as a windbreak against incoming patrons. We love the traditional food, the eclectic guests, and the perfect bistro service! Maybe you just have to get out of Paris to get the good local stuff. Our recent trip to the South and Perigord turned up lots of nicely cooked local products, fresh from the markets. Some really delicious, some just solid home-cooking type dishes, all served with pride and politesse…no rush, enjoy the meal, your friends, the view, whatever. The cafes and small restaurants in the south were not serving the regional specialties of the Perigord and v.v. The carafe wines were local and always pleasant, a couple of times amazingly good for the price. As much as I adore Paris, it is not all there is to France, which is why I am drawn back time and time again. I never tire of Paris and I never tire of the French countryside, but they are certainly quite different experiences, as you well know. hillaryn: That is true (I wrote about the vast difference between the outdoor markets in Paris vs the ones in the countryside) but one thing that I find vexing in France is that the restaurants on the autoroute are horrible. It’s either Autogrille or L’Arche fast-food type restaurants. I know the government just gave McDonald’s permission to open on the highways but there are no ‘truck stop’ style places even left anymore. 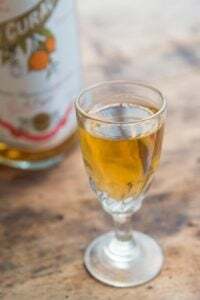 David: While I agree that the aires on the autoroutes are generally pretty weak, I did have some delicious fresh fruit and yogurt snacks, and they can be a decent source of local wines or other specialties if you don’t feel like stopping in a town. I find I can get the kind of little touristy gifts I need to bring back to my co-workers. The other good thing is that the toilets are generally clean and they have ATMs. David – my comment about the waiters at Chartiers wasn’t meant as a slur – I adore them. They all work so hard. – love the way they scribble illegible things on the tablecloth (even my French friend has trouble deciphering it), add it up, again on the cloth (well apart from one who used a calculator). It may help that my friend is a very gorgeous lady from Avignon with natural blonde hair and a gorgeous figure – so we always get good service! Once we were there with a US friend (older than me) who they deferred to first, then me, then my friend and breathed a sigh of relief that she spoke French! But we were both presented with postcards at the end of the meal. You may remember me as the girl asking if anyone wanted to have dinner with/give dining advice to an American girl in Paris. I must say that I was sadly, very disappointed with the food in France. Okay, hear me out. I did have some great meals there, but what disappointed me was just what you mentioned in your post: the fact that so many French were turning to packaged, frozen convenience foods and fast foods for their daily sustenance. 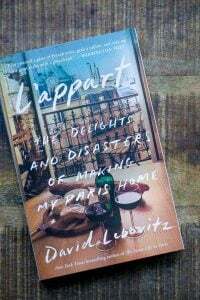 I went to Paris with a very pretty picture in my head of everyone shopping in open-air markets, families and friends taking the time to cook and eat what was in season together. I went to the markets and shopped for the evening’s dinner on a few occasions, spending a good part of my afternoon lovingly preparing lunches and dinners for my family that lives in Sartrouville. The markets blew my mind! The selection of wonderful seasonal produce and the quality of the meats/cheeses/charcuterie was incredible. But after a time I just gave up. The French people I was lucky enough to stay with preferred frozen, packaged tarte tatin and overcooked pasta with preshredded lowfat emmentaler and tomato sauce out of a tube to rabbit braised in wine with dijon, buttered new potatoes, braised radishes and rhubarb crisp. It was extremely disheartening. As a chef living in the Pacific Northwest it was heartbreaking. Perhaps it was just them, but in my experiences dining out in little brasseries I was also very disappointed. The flavors were flat….the food felt as if no one cared about it. However, just as I had given up, I plopped myself down in defeat in a tiny place on the Rue de Rosiers and had a meal that singlehandedly redeemed French cooking for me, making me feel that all was not lost. Cafe de Rosiers was so unassuming and the food was so honest and delicious, obviously made with care and love, that I was almost in tears. Go there. The family that runs it is so nice, the food is great, and it won’t set you back more than a few Euros. But enough about me……. Eli: I didn’t take your comment that way; I was just adding my 2 cents, that the waiters at Chartier could be construed as rude, but in fact, that’s just the demeanor they present. They just go to show that you can work in a high-energy restaurants, under stressful conditions (dealing with people who don’t speak your language, having too many tables at the same time, etc..) and still be good-natured about it & do a good job. 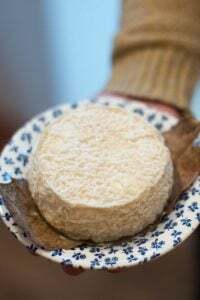 claire: Yes, there’s a perception that everyone in France eats well and a trip to the supermarket (or to someone’s refrigerator) shows they eat low-fat cheese, margarine, frozen foods, and relying on canned products. Like the states, there are people (and restaurants) that still serve & enjoy quality foods. I try to feature them here on the site from time to time, so they survive and prosper. Thank goodness you found one to redeem your situation. I know folks who eat at that little restaurant and like it as well. I’ve been engrossed by this post and the resulting comments, in large part because I’ve just spent some time with my [Dutch] brother in law and his companion, who is Venezuelan. They are appalled by what they perceive as the complete lack of service in this country, dismissing it as the bad French attitude. (Their reaction stems from a general service experience that also includes hotels, and other service industries). It pains me, as I do generally have positive service experiences in French restaurants. I think much of it does come down to cultural differences (his Venezuelan companion finds people here cold and peremptory). I agree with Clotilde: perhaps French people, especially in service positions, have a certain self-regard and don’t want to come across as servile. But their manner sometimes seems distant, and the service they provide can seem nearly an automatism, or an after-thought. When I get someone behaving that way in a Parisian cafe, I usually find something to remark upon or joke about, to break the ice, and make it more pleasant. I live in the south, and find the proliferation of bad to mediocre bistros distressing, as the restaurant experience is part of what I’ve always loved about France. What a pity. Please don’t get me started on the Subways. Have you tried Vagenende down on Blvd Saint-Germain? Or Aux Chien Qui Fume on rue du Pont-Neuf? It has been a couple years since my last meal at Vagenend, but I’ve had wonderful food and sevice each time I went, staying for many hours eating good food, drinking, talking and having fun. Same for Chien, the last time I was at Aux Chien Qui Fume we didn’t get out of there until around 2am and had a wonderful time. On the other hand a friend insisted we eat at Cafe des Flore… bad idea. But curiously, there are small restaurants popping up in Paris, such as Frenchie and Breizh Café that serve great food, at reasonable prices, and they’re always packed. So they prove that it can be done. I hope it’s a trend that continues. La Capitaine: Café de Flore is pretty inside, and interesting to have a (very pricey) cup of coffee there. But I’d agree that it’s not a place I would want to eat. I brought Clotilde’s guide with me last time I went to Paris, and every place I tried out was great. My coworker borrowed it and couldn’t thank me enough when he got back. Not sure how many “authentic” bistro’s were included though. I usually eat pretty well in France, some meals were even really memorable. Of course you can also find lousy spots from time to time, just because it’s France doesn’t mean they’re imune to mediocrity… I’m sure here in Belgium you can stumble onto a bad friterie or praline sometimes too. When I was in Paris, my wife and I found a fabulous little bistro near L’Hôtel de Ville by the name of Le Trumilou. My wife, a Montreal native, is quite fluent in French and was told the history of this generations-old place by the family patriarch. It seemed many of our fellow customers were regulars, and despite its proximity to Notre Dame, didn’t seem to do much tourist business. But, we were there off-season. That said, they have a website (letrumilou.fr) without an English translation, which I take as meaning they want regulars, not tourists. Prices were good, food was old-fashioned but fantastic, and the service was excellent. Most of it was traditional (Blanquette de Veau, Brandade de Morue, etc. ), but there were a few Moroccan inspired dishes, like a Brik de Confit de Canard that is probably the most delicious thing I had in our time there. Not surprisingly, they also had a Côtes du Rhone on the wine menu that we were unable to find anywhere else, and are now seriously thinking of having some shipped to us here in Canada. I too hate the North American, “how’s everything going so far?”. The staff at Trumilou were there when we needed them and out of sight when we didn’t. That idea of service is something you generally have to pay out the nose for here. They impressed us so much, we returned for dinner on our last night in the city, and it’ll be the first place we go to when we come back. If you get a chance, try the place out. I’d like to hear a native’s take on it. I’m a cook and I thought it was honest and unpretentious in both food and hospitality. I’d like to know if a Parisian finds this to be true, or if it’s just another “tourist place for non-tourists”. L’Ami Jean has yet to disappoint in the 7th. Wonderful atmosphere too since you can see right into the kitchen.. I like the distinction of being of service as opposed to being AT one’s service. Service is–and always has been–a fascinating dance. There are many that are bad at the steps and many others that excel. It’s incredibly frustrating–no matter what country you’re in–to be treated poorly and sold food that is sub-par. Thank you for sharing this enlightening service story! There will be many more to come!